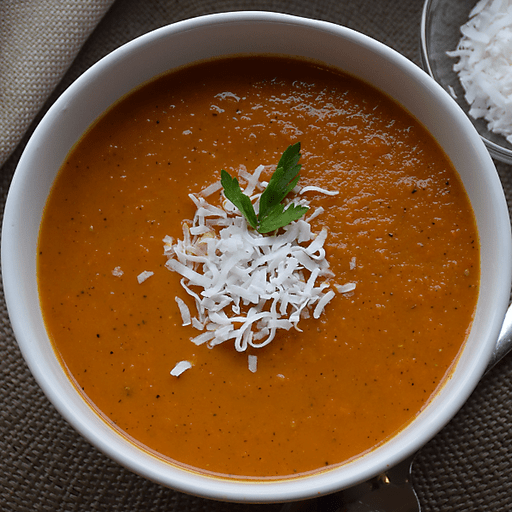 With a creamy blend of naturally sweet carrots and apples, satisfying coconut milk and just a hint of heart-warming spice, this Apple Carrot Ginger soup recipe is perfect for those cold, blustery days. And, to make things even better, this scrumptious soup recipe utilizes one of our favorite time-saving kitchen gadgets – the slow cooker! 1. Place the carrots, ginger and apple in a slow cooker. Add the garam masala, salt and pepper, and stir to combine. Add the coconut milk and water. Stir and place the lid on top. Cook on low for 10 hours or on high for 5 hours. 1. Use a handheld food immersion blender to blend the soup in the slow cooker pot. Cook for an additional hour. 1. Serve hot with a garnish of unsweetened coconut. Substitute allspice or pumpkin pie spice for garam masala spice. Calories 250, Total Fat 10g (Saturated 9g, Trans 0g), Cholesterol 0mg, Sodium 770mg, Total Carbohydrate 40g (Dietary Fiber 9g, Sugars 22g), Protein 4g, Vitamin A 760%, Vitamin C 30%, Calcium 8%, Iron 8% *Nutritional values are an approximation. Actual nutritional values may vary due to preparation techniques, variations related to suppliers, regional and seasonal differences, or rounding.